Wednesday Wrap: Technics Tracks, Google Project Fi, EE phones and more | What Hi-Fi? From the news that EE has released two new smartphones and two 4G wi-fi devices, to the news that the YouTube app will stop working on some old devices, and the launch of the Technics Tracks Android app - it's What Hi-Fi? 's Wednesday Wrap. 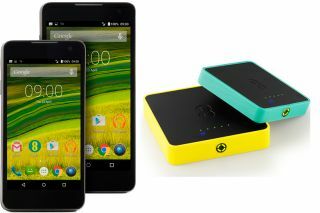 EE recently unveiled two new smartphones, alongside two 4G wi-fi devices, for use as portable hotspots. The first of the two phones is Harrier, which features a 1.5GHz octacore Qualcomm Snapdragon processor, 5.2in full HD 1080p display, 13-megapixel rear-camera and a 2500mAh battery. It can connect to EE’s double speed 4G network and also benefits from the company’s recently launched wi-fi calling service. The EE Harrier is available now for £200 on a pay as you go basis. The second phone: Harrier Mini, features a 1.2GHz octacore processor, 4.7in HD display and 8MP rear-facing camera. It too can take advantage of EE’s wi-fi calling service, and will cost £100 on pay as you go. The Osprey 2 and Osprey 2 Mini can be used to create a 4G mobile hotspot. The Osprey 2 features a 5150mAh battery which claims 15 hours of use, and can double up as a battery pack to charge mobile devices. The Osprey 2 Mini can have up to 10 devices connected to it at once. A range of pricing and data options are available for both and can be found here. Google has launched a phone service, Project Fi, in the US, which will offer voice calls and data using cellular networks and wi-fi. Project Fi uses the network spectrums of both T-Mobile USA and Sprint, to automatically switch between whichever is strongest. It will also take into account wi-fi hotspots, and will determine which network is fastest for your needs. There’s no contract, as you only pay for the data you use. Although you will need to sign up to a monthly data plan, $20 for 2GB for example, any unused data will be credited back to the next bill. If you go over the data allowance, you’ll be charged at a $10/GB rate. Unlimited calls and texts, including international texts will cost $20 (around £13) a month, and the data fee is then added on. For now, it’s only a limited release in the US and will only work with Google's Nexus 6 phone, due to the particular cellular radio it has and, more crucially, its the only phone compatible with the Project Fi SIM card. Google has yet to confirm if the service will get a worldwide rollout. Microsoft has released another update for the Xbox One and Xbox app on Windows 10. Users with the Xbox One Digital TV Tuner will now able to stream live TV from the Xbox One console to a Windows 10 PC running the Xbox app. TV can also be streamed to the Xbox One SmartGlass app on Windows 8 PCs, Windows phone 8, iOS and Android devices. The OneGuide on mobile devices will also support picture in picture (PIP). Preview members will be able to benefit from Miracast support on the Xbox One too, allowing them to mirror content from compatible devices on the TV. It will work with devices that support non-protected Miracast connections. A full list of the new features for Xbox One and Xbox app can be found here. If you use the YouTube app on devices made in 2012 or earlier, you may find it will no longer be supported. YouTube says it shut down the old version on 20th April in order to focus on upgrading the YouTube Data API. YouTube also said it will now focus on improving the official app for TVs, Blu-ray players, games console, streaming devices and set-top boxes. Technics has launched an Android app for its Technics Tracks high-resolution music download service. The app is free to download and offers a range of music, all available in FLAC format from 16-bit/44.1kHz (CD quality) up to 24-bit/192kHz. Songs that have been purchased through a web browser will be available to download to your Android device too, with them being stored in a cloud locker. Other music stored on your device can be accessed and played through the Tracks app too. An iOS version of the app will be available soon. Sony has announced a new show for its Video Unlimited 4K service in the US. “Powers” is PlayStation’s first scripted original series and centres around two homicide detectives investigating cases involving people with superhuman powers. UltraFlix will also now be available on Sony’s 2014 4K Ultra HD TVs, and coming soon to 2015’s models, although again, this is limited to the US. UltraFlix has a 4K library of over 300 hours of content, now including Interstellar. Thorens has a new entry-level turntable to add to its repertoire, in the form of the TD-203. Designed with a simple plug-n-play approach, the TD-203 comes fully assembled and is factory-set. Thorens says it takes no more than five minutes from opening the box, to playing a record. The tonearm can have azimuth - the left to right tilt of the cartridge body, looking from the front - and overhang settings adjusted, and the pick-up cartrige can be changed too. The tonearm used is the TP82, a uni-pivot design, with the arm tube being made from rolled aluminum. It comes preinstalled with the Thorens TAS 257 moving-magnet (MM) cartridge. The Thorens TD-203 is available now in glossy white, glossy black, or glossy red for £500, and comes supplied with a Perspex dust cover.